On Thursday, February 14th, 2019 Attikon University General Hospital held an inauguration ceremony for two new linear accelerators that have been installed in the hospital’s Radiotherapy Department, through a Stavros Niarchos Foundation (SNF) grant. The event was attended by the President of the Hellenic Republic and by SNF representatives. 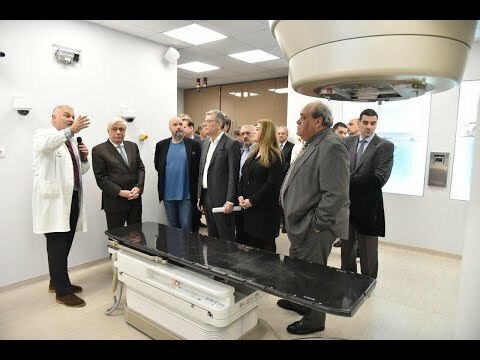 The inauguration ceremony marked the full implementation of the Foundation’s radiotherapy project, which includes the procurement and installment of ten linear accelerators in seven public hospitals around Greece. New linear accelerators have been installed in Attikon University General Hospital (Athens), the Athens Alexandra General Hospital, Theagenio Cancer Hospital in Thessaloniki, and the University General Hospitals of Alexandroupoli, Larissa, Patras and Heraklion. The grant also supports the maintenance of each linear accelerator for two years and includes a three-year training program for staff, which is being offered in collaboration with the Department of Radiotherapy Oncology of the University of Texas in San Antonio. Two employees from each public hospital that received a grant, one radiotherapist and one radiophysicist, travel to Texas to train on new treatment protocols and new machine capabilities, in order stay abreast of developments in the field of radiotherapy.